LOCATION.--Lat 43°04'51", long 76°13'35" referenced to North American Datum of 1983, Onondaga County, NY, Hydrologic Unit 04140201, on left bank 30 ft downstream from bridge on State Highway 48 at Lakeland, 0.6 mi downstream from Geddes Brook, and 0.7 mi upstream from mouth. PERIOD OF RECORD.--Occasional discharge measurements, water years 1959-70. November 1970 to September 1973, July 1975 to current year. REVISIONS HISTORY.--WDR NY-83-3: 1972 (M), 1976 (M), 1979 (M), 1982 (M). WDR NY-97-3: 1976, 1978-80, 1982. 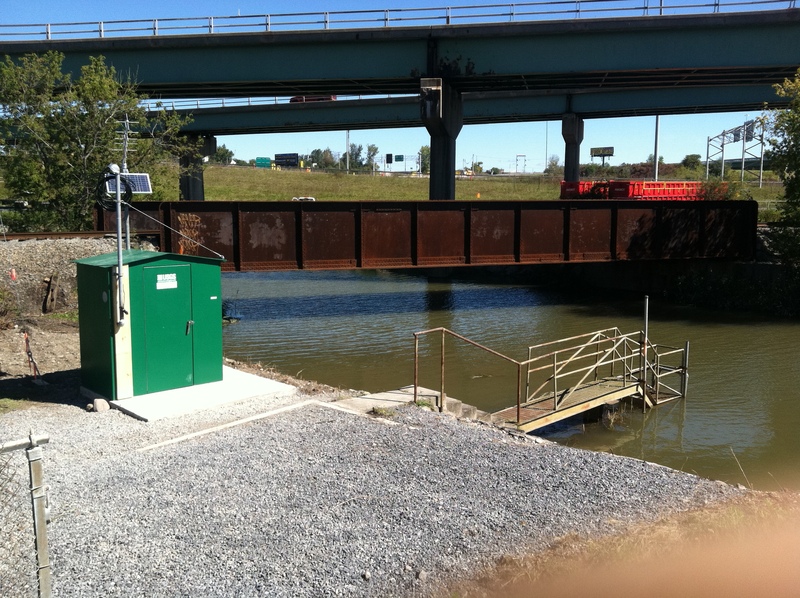 GAGE.--Acoustic velocity meter, water-stage recorder, and crest-stage gage. Acoustic velocity meter since October 2001. Datum of gage is 360.67 ft above NGVD of 1929 and 360.16 ft above NAVD of 1988 (VERTCON). REMARKS.--Flow regulated by Otisco Lake from which water is diverted by Onondaga County Water Authority for water supply. Flow affected by backwater from Onondaga Lake (station 04240495) whenever lake level exceeds about 362.0 ft.
Water Years 2014-15, 2017-18: Records fair except those for estimated daily discharges, which are poor. Water Year 2016: Records fair except those for Dec. 6-8, Feb. 16-17, 21-24, and estimated daily discharges, which are poor. EXTREMES FOR PERIOD OF RECORD.--Maximum discharge, 2,410 ft³/s, Sept. 26, 1975; maximum daily discharge, 2,110 ft³/s, June 23, 1972; maximum gage height, 9.63 ft, Apr. 27, 1993 (backwater from Onondaga Lake); minimum daily discharge, about 13 ft³/s, Aug. 18, 1985. Since water year 1976, maximum and minimum instantaneous discharges not determined.